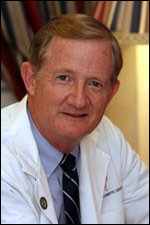 Dr. Doug Dedo ENT | Palm Beach Sinus Doctors | Over 35 Years Exp. 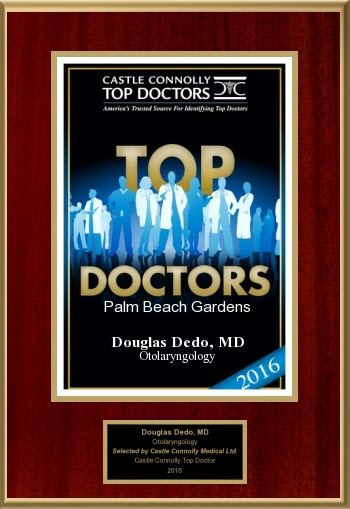 Dr. Douglas Dedo Palm Beach Gardens Sinus DoctorDr. Dedo is a leading provider with the latest technology of Balloon Sinusplasty™ in the Palm Beach Gardens area and has been in practice for 36 years in Palm Beach County bringing to his patients not only the tried and true medical and surgical treatments for diseases of the ear, nose and throat but also the latest techniques as well. 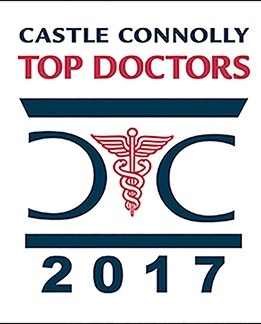 His vast experience, depth of knowledge combined with his incredible hands has earned him recognition repeatedly by Castle Connelly as one of the top doctors in otolaryngology as well as being selected by U.S. News and World Report as one of the outstanding doctors in his field! When you see Dr. Dedo you will instantly recognize his warm personality and attention to detail in diagnosing and treating you whether its your sinusitis and nasal obstruction or an ear ache that is keeping you awake at night. . If you are considering cosmetic surgery, it is important to choose a surgeon who has the experience, technical skill,castle-connolly-top-doctor-douglas-dedo artistry and compassion to deliver the results you desire in a setting that is focused 100% on you! Dr. Dedo and the professional and caring staff at Gardens Cosmetic Center are ready to nurture and guide you to your desired results. Liposuction, Face Lift, Neck Lift and Rhinoplasty are just a few of the cosmetic surgical procedures that Dr. Dedo is recognized for delivering long lasting results that look natural. Dr. Dedo earned his undergraduate degree at the University of Kansas and a Doctorate of Medicine at Northwestern University School of Medicine Chicago, Illinois. Dr. Dedo completed his residency in otolaryngology head and neck surgery (ENT) at Washington University School of Medicine, Barnes Hospital, St. Louis, Missouri. As part of his residency, he received training in facial plastic and cosmetic surgery. He next served his country and refined his skills in the US Air Force. Today he remains a pioneer in the field of Liposuction surgery and facial plastic surgery. Utilizing his knowledge and experience with Liposuction, Dr. Dedo developed and perfected a safe and effective alternative to Gastric By-Pass Surgery, called Sequential Liposuction and Body Sculpting or S.L.A.B.S. Dr. Dedo is a member of the American Academy of Facial Plastic and Reconstructive Surgery, the American Academy of Cosmetic Surgery and the American Academy of Otolaryngology Head and Neck Surgery. Although he performs a variety of procedures, Dr. Dedo is known for creating natural results that last for many years be it a Facelift, nose job, or other cosmetic procedures. Dr. Dedo has applied his expert caring and technical skills as a surgeon to thousands of South Florida patients for over 35 years.